It was supermodel Linda Evangelista who once said “I don’t get out of bed for less than $10,000 a day.” Well had Linda registered as model with Models Direct, that wouldn’t have been a problem. 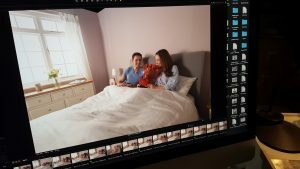 As you can see from these behind the scene modelling photos of Models Direct models Lucy and Gavin on their shoot with Mattressman, staying in bed was a necessity! Tucked up warm and cosy between the sheets, the two models had a great time modelling for Mattressman. This entry was posted in male model, modelling, Models, Models Direct and tagged behind the scenes, modelling, Models Direct by The Models Direct Admin. Bookmark the permalink.